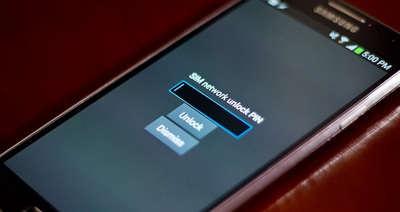 One of the biggest problems faced by Samsung phone users is finding their SIM locked to a specific network. This is something that is beneficial for individual networks as it permits them to provide subsidized commercial services to their customers. On the other hand, it tends to be a bad news for the users, as they cannot get any assurance whether a new SIM card will work on their phone or not. In most of the cases, the phone is locked if you bought it from wireless network provider, such as Verizon, T-Mobile, Sprint. To unlock a Samsung Galaxy phone, you have to provide the correct unlock code once you inserted new SIM card. In this article, I will introduce 3 different ways to get the phone unlocked. To get the maximum benefit from its paying customer, each network operator tries its best to utilize the most sophisticated encryption technology to protect the phone being used with other service providers. To unlock a phone from a specific carrier, the most secure way is to submit a support ticket asking for a unlock pin. If you are qualified to such a request, then they will send the code to you within 4 business days. If you got the code from them, it is a legit code for 100% sure. Here are the unlokcing policy for Verizon, Sprint and T-Mobile, please check it accordingly. The fact is that it will be very hard to receive unlocking code from the carrier because they have very strict policy towards such behavior. So if the carrier refused to offer the code, then keep reading and follow the suggestions in below. When you enter the keyword in search engines, you will find a lot of online websites offering SIM unlocking services. Unlike the method mentioned above, which knows how to generate the right code for each phone, those services are using computer programs to guess out the right code. The whole process is like this: you have to select the phone mode and wireless carrier first. Then input IMEI number of the phone. 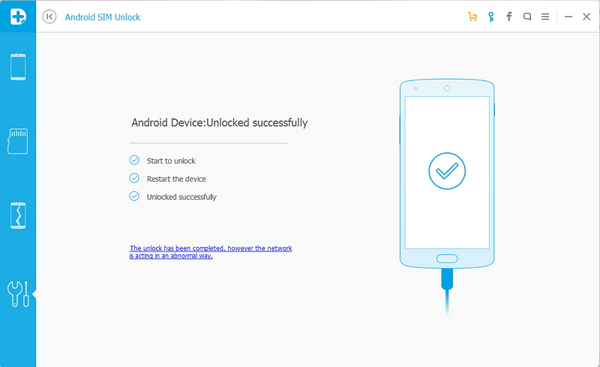 The website will lead you to a new page, which tells you the phone can be unlocked or not. If the answer is Yes, you have to pay around 30 USD to get the unlock code. You can’ tell the code is correct or not. So I did a test with 3 websites and all of the codes failed to work on my Galaxy S6. You should be very careful if you chose to purchase such a service. The third way is using SIM unlocking software. This is much secure and the whole process is under your control. One of the most effective software is called Android SIM Unlock, which comes with some attractive features like simple unlocking process with permanent results. It supports more than 400 Samsung devices and possibility operates in more than 60 countries. In addition, there is no damage to the data stored on your phone. With this desktop software, you can simply unlock your Samsung phone just within 10 minutes. 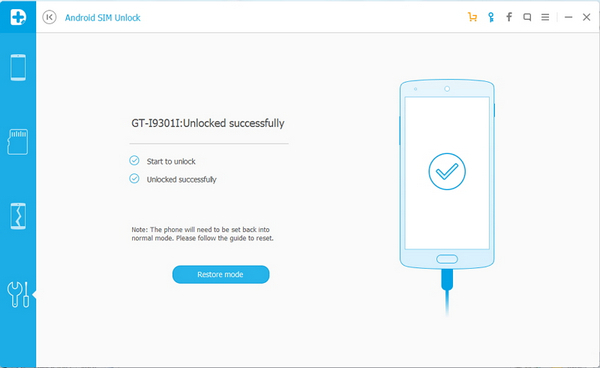 Here is the step-by-step guide on how to unlock Samsung phone sim card with this software. Initially, you will have to download the desktop software to a Windows computer. The Mac version is still under development. Then, install the program on the computer and open it. Click "More Tools" on left sidebar and select "Android SIM Unlock". Once the installation is completed, you will have to connect Samsung phone to the computer through USB. In here, you should make sure USB Debugging is enabled. It is better to check the battery is more than 20% before clicking the "Unlock" button to allow the software analyzing the phone. For Samsung Galaxy S3 to S7, you have to root the phone first due to the new technology restrictions, which will dramatically increase the success rate. 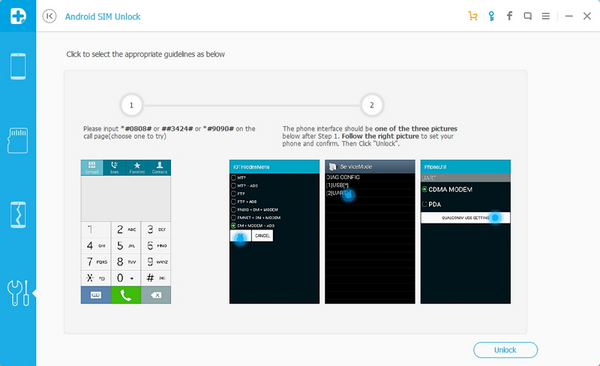 Once the phone was recognized by the program, click "Unlock" button to start the unlocking process. 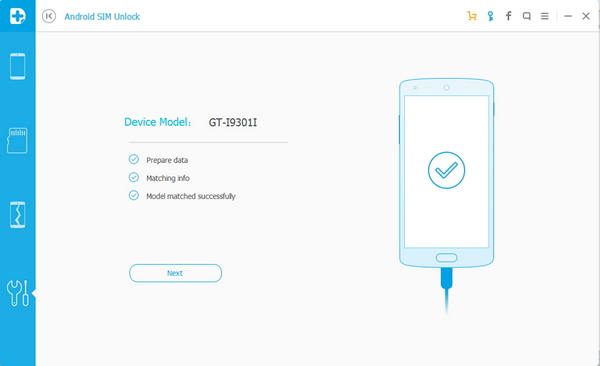 The Samsung Galaxy phone will be unlocked in a few minutes. For other Samsung devices, there is no need to root the phone. Once the phone being detected, click "Next" button. Then there are detailed instructions on the screen telling you how to do next. Now, open the dial app on the phone and type *#0808# or ##3424# or #9090#. One of them should work for the phone. The phone will be prompted to new screen after inputting the code. The option is different for different modes. Please choose DM + MODEM + ADB or UART[*] or CDMA MODEM on the phone. Finally, click on "Unlock" button to begin the unlocking service. 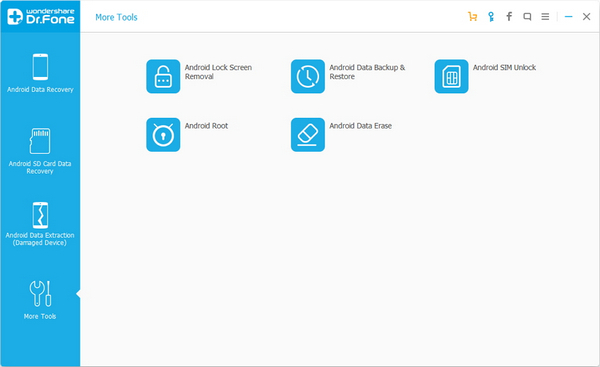 This desktop software works by analyzing the locking methodology on the SIM Card and will select the suitable method to unlock Android phone or tablet after analyzing the device. Just wait for some time for the software to complete the unlocking process successfully. If you wish to check whether the unlocking has been successfully completed, you can do this by inserting a SIM from a different carrier to find whether the phone accepts the new SIM.